Jasmine is sneezing non stop.She is fed up using all kinds of medications. She can’t breathe because her nose is always blocked.A coblator reduction of turbinates and the trigger zone inside the nose in Jubilee Hospital, Trivandrum, South India.is being done under local anesthesia. Sneezing is caused by irritation to the mucous membranes of the nose or throat. It can be very bothersome, but is generally not a sign of a serious problem. 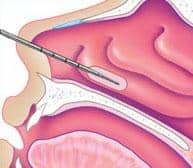 If you are fed up using all kinds of nasal sprays, anti allergic medications and injections, and no avail, then think of this minor surgery â€“Laser and Coblator Surgery under local anesthetic. It gives very good result. And not very expensive, when done as a day case procedure. The Coblator turbinoplasty is performed under local anesthetic, afterÂ injecting 4% Xylocaine with adrenaline. Patient is kept semi sitting in an ENT chairÂ and the turbinates are coblated. The procedure takes 10-15 mnts on each side. There is hardly any bleeding and patient goes home after few hours. This gives very good result for nasal blockage and sneezing. Coblation a revolutionary medical technology developed and patented by ArthroCare Corporation Â enables surgeons to precisely dissect and ablate soft tissue while preserving the integrity of surrounding healthy tissue. Coblation technology uses electrical energy to excite the electrolytes in a conductive medium, such as saline, creating a precisely focused plasma. The energized plasma particles possess sufficient energy to break organic molecular bonds, resulting in tissue dissection and ablation. Coblation dissects or excises tissue while preserving the integrity of surrounding healthy tissue. Because the RF current does not pass directly through the tissue, with Coblation, relatively low temperatures (40Â°C to 70Â°C) are generated as a by product ofÂ the process. Coblation is not a heat-driven process; therefore it does not char or burn healthy tissue like conventional electro surgery and laser surgery. Coblation is derived from the term “controlled ablation” It combines radiofrequency energy with a natural saline solution to gently and precisely remove tissue leading to a fast and easier recovery.This advanced surgical technique results in reduced pain, less bleeding and faster recovery for patients. Unlike the traditional method, Coblation technology literally â€˜vaporizes\’ the tissues. As there\’s no cutting or heat involved, there\’s no charring or burning of healthy tissue, which is great news for patients. Â What Type of Surgeries can be done?As I do lot of surgery for Snoring and Sleep Apnea , it is very good instrument to perform Tonsil and Adenoid removal, Coblator Assisted Uvuolplasty (CAUP), Base of Tongue Reduction (BOT), Lingual Tonsillectomy, Coblator reduction of turbinates in the Nose etc.